We reviewed many cordless microscopes and below have listed the best cordless field microscope options. 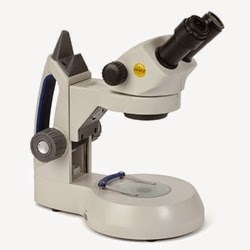 The Richter Optica F1 kids microscope is hands down the best option for a cordless kids microscope. This microscope uses a cool LED light - this is important in order to keep live specimens from getting killed by the heat of the microscope light! The microscope has coarse AND fine focusing - very important in order to view a clear image at 400x. Glass optics = clear images. Magnification of 40x, 100x, 400x - high enough to view bacteria, blood cells and Protozoans in pond water. Lightweight at only 3 lbs. and easy to carry. The Richter Optica F1 sells for $99. perfect for viewing flowers, rocks, insects and any other item that might be found out in the field and held in the palm of your hand. Cool LED light won't heat up. Top light and bottom light can be operated independently of each other. Carrying handle makes this dissecting microscope easy to transport. 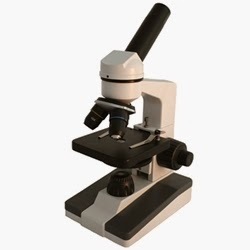 The Swift SM105 stereo microscope sells for $489. The Richter Optica UX-1 is a great advanced high school microscope. With Plan Achromat objective lenses the full field of view is completely flat, crisp and clear. Binocular viewing makes it easier to view specimens through the microscope and the mechanical stage makes maneuvering these samples even easier. Magnification of 40x, 100x, 400x and 1000x provides standard lab magnifications for viewing everything from bacteria and cells to pond life creatures. Without any cords to worry about, the UX-1 is also quite popular among veterinarians. 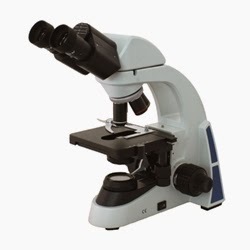 The UX-1 compound microscope sells for $699. includes a 10" LCD Tablet camera. The camera has a 5 mega pixel camera and an SD card slot, as well as HDMI output. The Android tablet provides a touch screen and measurements can be made as well. 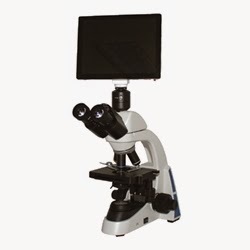 The UX1-LCD tablet microscope sells for $1989.